Even though I'm a staunch supporter of the LMB school of thought, I can admire some pieces of excellence from the rival creative schools. This one by Experian is deceptive in its simplicity. Take a living being that is a sure comedic bet, add a thing that makes a hilarious prop, provide interplay between the being and the thing, and a hit is born. In this case, a choosy monkey seems to be in a fix in picking the right sized credit rating... err, banana. 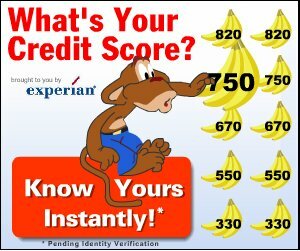 The sad thing is, a cartoon monkey seems to have a better credit rating than me.